Hi Friends: There is a new challenge today over at the Crafting When We Can Challenges Blog, where the current theme is Bright and Colorful. Please visit our fabulous sponsor this week, Oddball Art Co., to see all of their wonderful products! My creation for this week is an easel card using the really cute image called Sally and Charlie. I just love this adorable fairy! 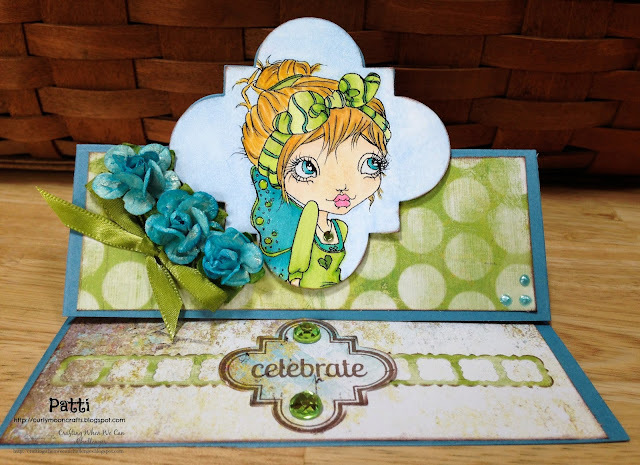 And the easel die makes it so easy to create this style of card. Here's the outside of the card - I thought it would be fun to have her looking up at this cute butterfly. Print image onto smooth white cardstock and color with Spectrum Noir markers. Die-cut image with large shaped die from Playful set, ink edges, then apply Glitter Brush pen to wings and headband. For a bit more shine and dimension, add a bit of Glossy Accents to the circles on her wings and a small gem to her necklace. Cut card base from Marina Mist cardstock using the Stand-up framelit die. Cut coordinating card panels and border strip from the Kaleidoscope papers, and assemble card. Add focal image to card with foam dots. Color mini roses with blue LSG sprays and add to card as shown. Color white ribbon with the green markers and add under roses. Color butterfly with blue and green markers and add to card. Finish card front with some Pearl Pen dots. Add rectangle panel of the Kaleidoscope papers to inside of card, then add border towards the bottom of the easel portion. Stamp frame and sentiment stamp in brown ink onto the green patterned paper, cut with matching die, and add to inside panel. Finish with some green gems as shown. Sally and Charlie digital image from Oddball Art Co.